Not having pearly white teeth is an issue that concerns many women. Alas, the natural color of teeth is not always perfect, and all kinds of toothpaste and other whitening means sometimes do not help. White teeth is an important factor, which determines the degree of attractiveness. So what to do? I want to help your smile be radiant and for your teeth to look perfectly white. What is the lipstick tooth whitening? What lipstick should you choose in order to visually whiten your teeth? The answer is to choose all shades of red and blue midtone such as cold pink, raspberry, and cherry. Warm red is not suitable for this purpose at all. It will only accentuate the yellowness of teeth; the result would be quite different. Other colors to avoid include beige, brown, carrot, coral, lilac, and purple. Even if it is believed that these colors suit you best, you should avoid using them. Look at pictures of models, actresses, and other celebrities to learn how warm shades of lipstick can affect the perception of the color of teeth. Moreover, the impact is far from the best. So, avoid warm colors by all means, especially if the color of your teeth is far from ideal. But it's too much. A smile is very useful! It is scientifically proven that positive people achieve much more in life and get ill a lot less. A smile can help you say a lot without words. You can understand each other better, give someone hope or joy. Lipstick that visually whitens teeth will make you feel friendlier and more confident in yourself. In addition, you will definitely not be disappointed looking at your photos the day after any grand event or fun party. You no longer need photoshop because your teeth and your smile will look just fine. Teeth whitening lipstick: true or false? Lipstick can be easily found in every woman’s purse. It has already become inevitable part of their make-up. In addition you will only need a couple of seconds in order to refresh the color of your skin and shade your eyes with the help of this small tube. It will take you a moment in order to create a beautiful and attractive smile. Fashionable women are well aware of the fact that there are certain rules when it comes to a color of lipstick. You should take into consideration several very important factors. First of all condition of your skin plays a great role. It must influence your choice together with the color of your eyes and shape of lips. If you have a pale skin you are recommended to use cold colors which are based on blue tone. Natural and gentle colors will be also a perfect choice. Dark skin will have a beneficiary look in combination with bright and colorful lipstick which is based on yellow tone. Gold or red lipstick will be the best bet for women with beige skin. However you should be very accurate as if you use it incorrectly, you will create a background which will stress excessive blush and blue tone under your eyes. You should also consider the color of your hair while choosing a perfect lipstick. The luxury of blond hair can be stressed with the help of peach, pink or coral color. Brown tones would be a perfect choice for women with hair which has a copper color. Practically every tones and colors will suit brunettes. There is only one rule for them which says “the darker hair – the brighter lipstick”. How to apply lipstick, visual whitening teeth? In some cases, the need lipstick, tooth whitening? When you choose the most appropriate lipstick you should never forget about your eyes. Teal and grey eyes will be perfectly combined with cherry and beige lipstick. Green eyes are calling for orange, and brown eyes are in search of red and brown. If you choose your use correctly, you will get a chance to stress the beauty of your eyes and hide all drawbacks of your face. How does whitening lipstick work? Nowadays every woman has a chance to get a lipstick of the color she prefers. All possible tones are available. However some shades can’t be combined with a natural color of your teeth. For example, some pink and violet shades can have a different effect on the color of your teeth. They can make your smile really outstanding and together with whitening effect. At the same time they can make your teeth yellow. The same thing when you use wet-orange or red-violet lipstick. That is why the majority of women first of all try to determine which lipstick will be the best bet in combination with the color of their teeth. Cosmetic brands are trying to meet all your requirements and demands. They offer new products which turn out to be essential for those who are eager to have an outstanding and attractive smile. Whitening lipstick is the best tool for those who want to create a perfect make-up. It has 2 main features and effects. It contains optical components which are called white focus. 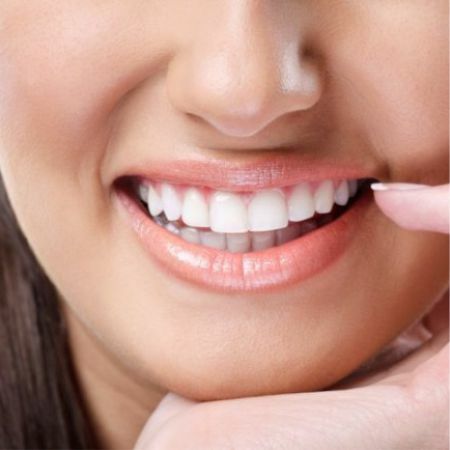 They make it possible to create a visual effect of white teeth. This gloss works together with fruit gel which contains special blue pigments which allow you to make teeth whiter. However you should keep in mind that this is only a visual effect and this lipstick is not actually able to whiten your teeth. At the same time it will let you smile with pleasure anytime you like. Like the article «Lipstick that Visually Whitens Teeth»? Share it with friends!